[Short, sharp whistle] Feet on the floor, soldiers in the war on Christmas! This morning, please look across the pond to the United Kingdom for an example of action that furthers our cause. 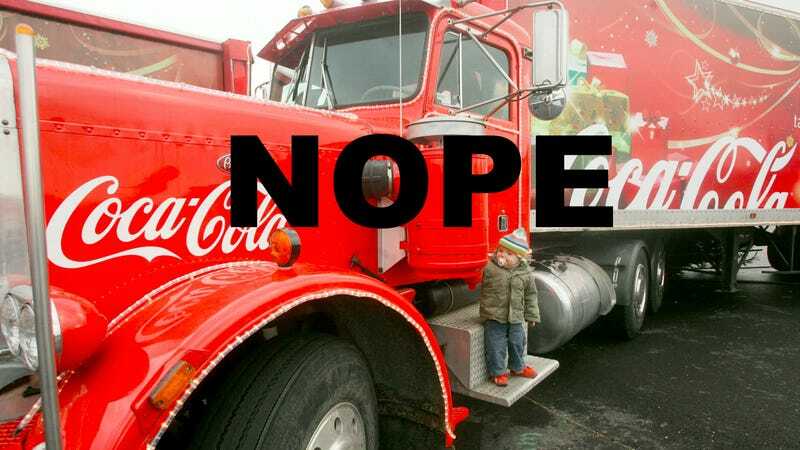 Every year, Coca Cola sends a giant, festive truck on a Christmas tour of the United Kingdom. (It’s got something to do with this commercial.) Well, one man is taking a stand. The BBC reports that Kevin Vaz, a diabetic and the MP from Leicester, doesn’t want that truck coming to his town. “The Coca-Cola truck is not welcome in Leicester, and this national tour to promote sugar-laden drinks is ill-judged and unwise at a time of record diabetes and obesity levels,” he told the Leicester Mercury. Mr. Vaz’s brave position has not been met with cheers, BuzzFeed reports. He’s been called a grinch, accused of canceling Christmas, accused of hating Christmas. Perhaps you agree. Perhaps you think the annual Christmas Coca-Cola truck tour of the United Kingdom is a wonderful tradition. Maybe you love those Santa cans. Hell, I love those Santa cans. But let me tell you this—just yesterday, a correspondent sent me a photograph of his local CVS that I can only describe as bone-chilling. Not just bins of wrapping paper and seasonal candy displays as far as the eye can see, but also a Christmas tree and an animatronic Santa. This photo was taken November 4—just yesterday. Clearly, dire measures are in order. Those measures might include forgoing the Coca Cola Christmas truck this year or perhaps even for several years to come. But we must be steadfast!